after download a file, EagleGet shows a dialogbox on the lower right hand corner with "Open" and "Open Folder" option. I know the forum has been asking for BT for a long time, but I am opposite...I'd rather not see BT running with EagleGet. But now that feature has been implemented, is there a way to disable BT from running at all? My firewall sees BT traffic "leaking" from my machine. 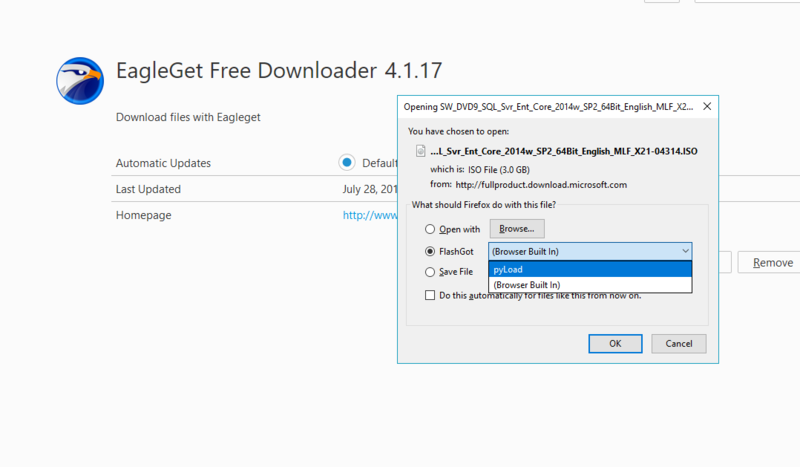 trying to download some Dell drivers and found out that EagleGet doesn't work if the download link ends with .EXE (instead of .exe)? Some other links will have ".EXE"...when you click, browser's download dialogbox shows up. With that said, I still appreciated the dev's hard work on churning out the new version. I believe the installation of extension went well, but when I clicked on an ISO, I don't see EagleGet? how come the banner still says 2.0.4.13 is the latest version? Where do I send the ZIP file for analysis? wow, totally missed that "Option" button on the upper right hand corner...THANKS!!! "Don't monitor the following sites" feature is missing from the v2 beta? Could you please make the version number of the program itself, as well as the Chrome and Firefox extension, matches? As of today, the latest version number is 1.1.8.0, but my Chrome extension version is 1.6 and Firefox extension version is 2.5. I have to click "Cancel" on each one. I went to EagleGet Configuration and added "www.google.com/voice/media/*" as "Don't monitor the following sites", but this doesn't work. Thanks and keep up the good work! Really appreciate you making this available to the community! !